In 1986 the Tread of Pioneers Museum was given a rather odd gift from Guthrey Drake. The gift was a human tooth, a gold tooth to be exact. 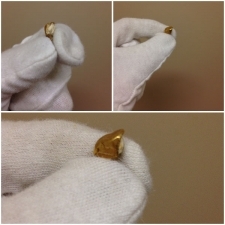 The tooth, we are told, was found by Guthrey�s father, George Drake in 1900. George Drake was a gold prospector in Hahns Peak and it was during his searching that he found the tooth. Hahns Peak is located about 25 miles north of Steamboat Springs. Today Hahns Peak refers to both a mountain as well as the small community near the mountain�s base. BUT, before it was known as Hahns Peak, the area was actually comprised of several small camps located around mining sites. According to our museum collection records, the Drake family believed a miner used the tooth as payment for drinks in a Hahns Peak saloon. This miner may have been down on his luck, and he may have had to extract the only thing of value he had in order to pay his bar tab. When you consider the history of Hahns Peak in the late 1870s to early 1900s, this �tooth for spirits� story becomes more believable. Hahns Peak was once the largest town in the area, and because it was a mining town, the population was almost entirely young, unmarried men. After working a long hard day, miners had little else to do with their time (or money) so the saloon became the social center, for better or worse. It didn�t start out this way though. In 1875 a wealthy businessman, John V. Farwell, bought six placer mine filings. The conglomerate was called International Camp. The community was mostly comprised of Farwell�s employees which included 75 adults and no children. Farwell had good intentions of keeping his company town respective; he built a church and did not allowing dancing or liquor. Not surprisingly, it wasn�t long before a sister camp was created, about a mile away from International Camp. �Poverty Flats� defiantly did have alcohol and a saloon, several saloons actually. To the miners who chose to live in Poverty Flats, International Camp became known as �Bugtown� because that is where Farwell�s company officials, or �big bugs� lived. By 1880, Farwell sold out and business moved to Poverty Flats. Eventually Poverty Flats became known as Hahns Peak. The county court house (as well as the county seat) was located in Hahns Peak from 1879 until 1912; Hahns Peak was booming. Miners were recovering gold, silver and other ore, and word was spreading around the state and beyond about the potential laying in Northwest Colorado. Because some gold was found, much mining production was made. Some miners dedicated their entire life to finding �the mother lode.� Some made a little money, but many like Farwell and our mysterious miner who�s tooth I now hold in my (white gloved) hand, put in more than they were able to extract from the famous mountain. Hahns Peak holds many more fascinating stories! 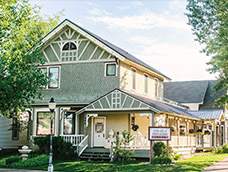 You can learn more at the Tread of Pioneers museum, better yet, take a drive and visit the Hahns Peak Historical Museum this summer. We also have a Brown Bag lecture �Hahns Peak Boom to Bust� on Aug. 21st from 12:00 to 1:00pm. For more information check our website at wwww.treadofpioneers.org or give me a call at 879-2214.